Let’s Not Blow This Out of Proportion! 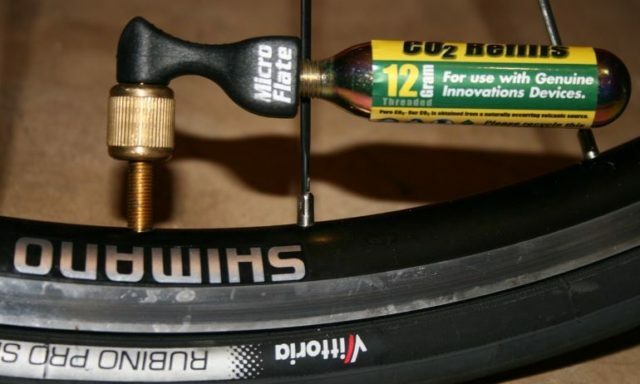 As I changed some tires in preparation for the spring; I moved from 23mm to 25 mm on my road bike. I carry CO2 and a 16g cartridge has worked well for me. Since I don’t carry a gauge, I used the finger test and stopped when it was “hard enough”. When I got home I’d drain the CO2 and pump up the tire with a floor pump; good advice since CO2 leaks out quicker than O2. I decided to check the PSI attained with the 16g cartridge in the 23mm and 25mm tires to assess the accuracy of my finger checks. Since I also have bikes with 35mm and 37mm tires, I wanted to see how 20g and 25g cartridges worked with these sizes. The inflation chart on MTBR.com only addressed 18g (I’ve never seen this size in any LBS I’ve visited) and 25g sizes. An old Genuine Innovations chart listed only 700 x 23, 28 and 35mm sizes. Unfortunately, when I checked the current chart on the Genuine Innovations site, it was vague. Simply listing the categories as road and touring without specifying exact tire sizes was not instructive. I wrote to them and I’m pleased that they responded within 48 hours with some specifics. Their response is below. As you likely already know, actual tire widths can vary from brand to brand and even model to model within brands so the last sentence in the letter below should be kept in mind. Thank you for contacting ITW Tire Repair. I forwarded your email to our Genuine Innovation team and below is his response. Here are my calculations on his listed tire sizes. As always, these estimates are subject to variation based on elevation and ambient temperature.